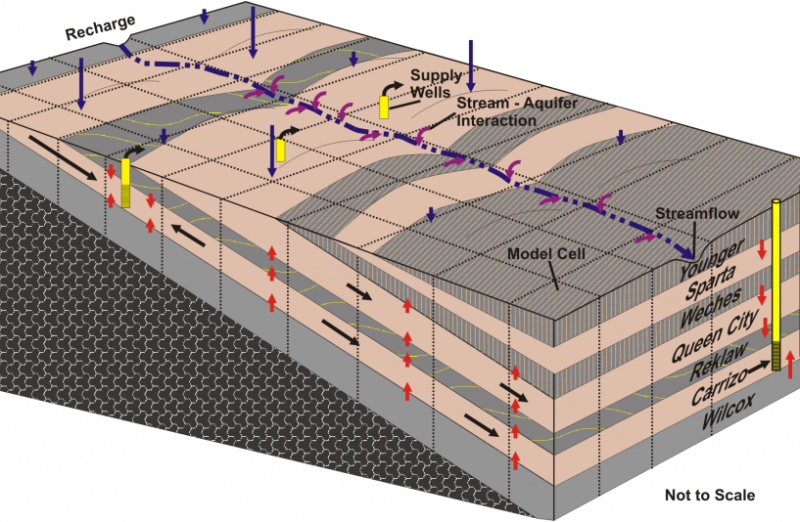 The figure shows a generalized cross-section of the Wilcox, Carrizo, Queen City, and Sparta Aquifers in our groundwater district and how water enters moves through and is stored in the aquifers. The Aquifers crop out in belts across the district that trend roughly northeast-southwest, roughly parallel to the coast. As shown in the figure to the right the aquifers dip to the southeast at an angle slightly greater than the slope of the land surface (about 150 - 200 feet per mile) and most of the formations thicken in the same direction. The Wilcox Aquifer is composed of clay, silt, fine-to medium-grained sand and sandstone, sandy shale, and thin beds of lignite. In Gonzales County, the upper part of the Wilcox is very shaly and appears to act as a confining layer between the middle and lower Wilcox and the Carrizo Aquifer. The thickness of the Wilcox ranges from about 1,300 to 3,200 feet. The Wilcox yields small to moderate quantities of fresh to slightly saline water to a few wells in and near the outcrop from the northwestern part of Caldwell County to the Central part of Gonzales County. The Carrizo Aquifer is overlying the Wilcox Group unconformably and is composed of fine- to coarse, loose, cross-bedded sand and some thin beds of sandstone in the upper part. The thickness of the Carrizo in the subsurface ranges from about 385 to 950 feet. The Carrizo is the principal water-bearing formation in the district, yielding moderate to large quantities of fresh to slightly saline water. The cities of Gonzales, Nixon, and Smiley and the Gonzales County Water Supply Corporation use water from wells completed in the Carrizo Aquifer. The Queen City Aquifer is separated from the Carrizo Aquifer by the Reklaw Formation. The Queen City is composed of massive to thin-bedded medium- to fine sand and clay. The thickness of the Queen City ranges from about 400 to 825 feet, where the entire section is present. The Aquifer yields small to moderate quantities of fresh to slightly saline water to wells in the outcrop and downdip for a distance of about 5 to 8 miles. The city of Waelder uses water from wells completed in the Queen City Aquifer. The Sparta Aquifer is separated from the Queen City Aquifer by the Weches formation. The Sparta consists of fine- to medium grained sand with some shale. The thickness of the Sparta ranges from 0 to about 140 feet and averages about 100 feet in Gonzales County. The Sparta yields small to moderate quantities of fresh to slightly saline water to wells in the outcrop and downdip for a distance of about 3 to 6 miles. The Yegua-Jackson aquifer runs approximately parallel to the Gulf of Mexico coastline and is aligned across the south-central portion of the GCUWCD in a narrow band approximately 7 to 10 miles wide. In Gonzales County, the Yegua Formation yields small quantities of slightly to moderately saline water for domestic use and for livestock. At some places in the County, sands in the Jackson also yield small quantities of fresh to slightly saline water for domestic use and for livestock. The Yegua Formation is composed of medium to fine sand, clay, silt, small amounts of gypsum, and beds of lignite. The Yegua has a maximum thickness of about 1,000 feet. The Jackson Group conformably overlies the Yegua Formation and consists of clay, silt, tuffaceous sand, sandstone, bentonitic clay, and some volcanic ash, and has a maximum thickness of at least 950 feet and possibly as much as 1,200 feet. The main source of groundwater is precipitation on the surface of the earth. A large part of the precipitation runs off or is consumed by evapotranspiration, or is stored in the soil later to be evaporated or transpired. A small part of the water infiltrates through the soil and subsoil and moves downward to the water table and becomes recharge. Factors affecting recharge include the intensity and amount of rainfall, the slope of the land surface, the type of soil, the permeability of the aquifer, the quantity of water in the aquifer, and the rate of evapotranspiration. Other sources of recharge can be seepage from streams, springs, and reservoirs. In the sandy outcrop areas, groundwater is unconfined and is said to be under water-table conditions. Downdip from the recharge area, the aquifer may be overlain by less permeable material and the water becomes confined when it is then said to be under artesian conditions. Groundwater moves slowly (tens to hundreds of feet a year) under influence of gravity from areas of recharge to areas of discharge. It is discharged naturally through springs, by transpiration where the water table is close enough to the surface that it may be reached by the roots of plants, and by seepage through semi-confining beds or along faults into another aquifer having a lower head, or to the land surface. Artificial discharge is that from flowing or pumped wells.